Read the texts, then decide if sentences are 1–6 “Right” (A) or “Wrong” (B). For questions 1–6, choose A, B or C. If there is not enough information to answer choose “Doesn’t say” (C). 1 Jenny’s husband is Peter. 2 Elizabeth is an architect. 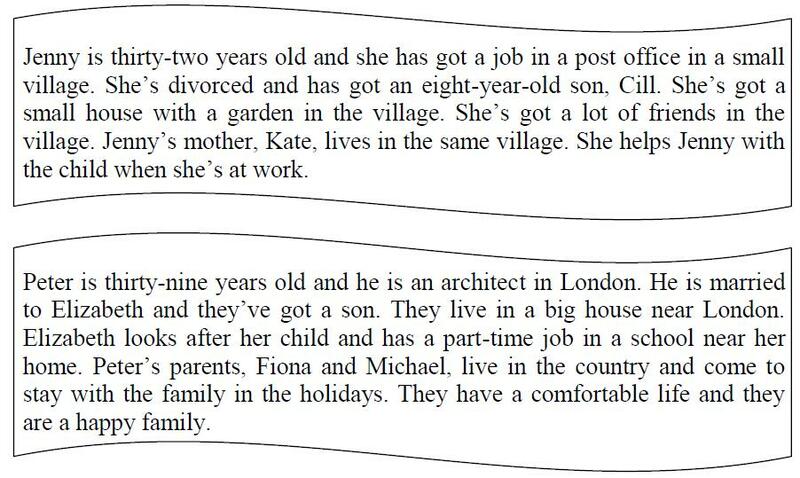 3 Peter has got two children. 5 Jenny has got a part-time job in a school. 6 Jenny has got a house near London. Read the text about Stewart Jones and complete the sentences 1–5 with the most suitable ending A, B or C.
Stewart Jones is thirty-nine years old. He is a policeman. He lives in Dover, in the south-east of England. Stewart lives in a small, comfortable flat with his wife, Jessica and their son, Jason. Jessica is twenty-eight years old. She is a vet. Jason is seven years old. He goes to school every day from 9 am to 3:30 pm. Stewart is good-looking. He is tall and well-built with short brown hair and brown eyes. Everybody likes him because he is a kind man and a very loving father. In his free time Stewart likes playing basketball. He doesn’t like watching TV. He thinks it is boring. 1 Stewart Jones is … . 2 Everybody likes Stewart because he is … . 3 Stewart’s favourite free time activity is … . 4 Stewart doesn’t like watching TV because … . 5 From 9 am to 3:30 pm Stewart‘s son usually … . 1 Do you say his ______ name is Boris? 2 His mother remarried, he has a ______ now. 3 Some children ______ to read before they start school. 4 In history we had to learn a lot of dates by ______. 5 Where is she? She is ______ home. 6 There ______ not fifteen children in the classroom. 7 He hasn’t got ______ brothers or sisters. 8 I don’t remember where ______ relatives were born. 9 My aunts are ______. 10 My uncle ______ very muscular arms. 1 Don’t worry, everything will turn out all right. 2 Wait a minute, let me see. 3 Sam was born in Scotland but when he was two, his father got a new job in Los Angeles, and he grew up in California. 4 Ann always does her homework in a hurry. 5 In this country applicants take their entrance exams in July. 6 She worked very hard and made great progress. 7 He failed to pass the examination. 8 For many people, the worst time of day is the rush hour. 9 I live and work in the suburbs, but I usually go into town two times a week. 10 One problem is that there’s nowhere to park in the centre, so I usually take a bus into town. This is a part of the letter you’ve received from an English friend. Now you are writing a letter to this friend. Write your letter in about 60–80 words.